I have been waiting for far too long to write this up. I was putting it off in hopes that I would be able to provide video or screenshots, etc… but alas, my schedule has not permitted me to do anything too exciting or fancy. You will have to rely o nthe already established Battle-Cars image gallery. I have been following Supersonic Acrobatic Rocket-Powered Battle-Cars for a long time now. But what of it after it released? You will be glad to know that I got my hands on the game, and am finally able to give you a little more details. First, if you have a PS3, and have not downloaded the demo of the game: do so! The tutorials and demo levels make the game extremely easy to learn, and give a better demonstration than any preview, review, or summary is ever going to do! I like to know what I’m doing, before going online and getting destroyed by every player under the sun, so I took the detour of going through the tutorial levels first. They teach you almost everything you need to know about driving the vehicle, dodging oncoming traffic, jumping, using the ramps and walls to your advantage, and going supersonic. The one thing you don’t get a big lesson in: ball handling. You learn a few blocking techniques, but after playing online, you’ll notice a few players out there are just as good in this game as Beckham with a soccer ball. Still, once you get the basics down, you want to hurry out online and see just how good you really are. You’ll learn right off the bat that supersonic is only one of the many keys to success. Going fast will get you destroyed, or foolishly send a ball in to your own goal, than most other techniques in the game. Pay attention to the tips the game gives before each session: they know what they’re talking about. Jumping before hitting the ball is an excellent way of keeping the ball on target, and getting into the goal, instead of right above the goal! You may also recall our interview with Dave, in which he advised players not to be affraid to jump for the ball – so true! Nothing surprises players on the ground, waiting for the ball to fall, like shooting up and taking it like an NBA toss up! But what about the game itself? What can I say, it’s pure fun. During the interview, Dave had suggested that the game was intended to have multiple play types, but they kept coming back to this one. It’s easy to see why. It’s fast paced, it’s fun, and oh yeah – it’s addictive. Graphically, the game might not be the most impressive thing you’ve ever seen, but it plays like liquid. Everything is smooth and fast paced, even after a goal is scored the action doesn’t stop with a ball sitting in a goal! The sound did receive some attention, but much like the graphics, sometimes feels like an after thought. The music is good and the sound effects fit right in, helping to reinforce the feeling that you’re slamming your vehicle into a large metallic orb. As an added bonus, the game offers great potential for building teams and leagues, as well. People could develop special moves, and tandem techniques, with enough time together. I look forward to playing this game on a regular basis. Earning trophies should also help a few people who might not be itnerested in the off-line game mode delve a little deeper! The multiplayer makes it easy to find and join friends from your friends list, as well. All in all, I’d give the game an 8.4. Not the most outstanding work from the artist’s perspectives (visual or audio), but the game is fiercly addicting and all ’round fun. It nails the casual gamer market, in that I can play a few rounds and put it down – come back to it later, play a few rounds… I’m not forced to sit infront of my TV for 13 hour sessions of “I just can’t turn away” like Metal Gear Solid 4 or Dead Space. The fact that others are finding it fun can easily be seen at MetaCritic, where users are averaging the game at a whopping 9.5! As a final word, you will notice I did not get into the excellent features of the game – such as uploading your videos to Youtube. The simple fact is I have not played around with that much at all, and while I think it is exciting and shows great potential for the Playstation 3, I just don’t think that it should have any bearing on the overall score of the game itself, which is why I didn’t goo out of my way to look at those for the review. New Feature: Galleries! Starting with Battle-Cars! In another effort to add just a little more flavor to the website, I will be adding galleries of games whenever possible. Our first one will start here and now, with an 11-image gallery of the upcoming PSN game, Super-Sonic Acrobatic Rocket Powered Battle-Cars. You may have heard a thing or two about the game coming out this Thursday. So why not take a look at it? 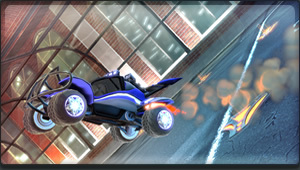 Posted in GamingTagged Galleries, PsyonixLeave a Comment on New Feature: Galleries! Starting with Battle-Cars! Battle-Cars dated and priced: SOON and CHEAP! Out of the information they were able to get, Dave finally let the word out that the game would release to the Playstation store on October 9th, for the super-low price of $14.99, and include Trophies! Posted in Gaming, PlaystationTagged PsyonixLeave a Comment on Battle-Cars dated and priced: SOON and CHEAP! [update 1] WBX: Supersonic Acrobatic Rocket-Powered Battle-Cars Developer Interview! NuAngel: To begin with, I’d like to thank you for taking the time out of their your day for a lowly blogger like myself. So, first question: what is your name, and what is it you do at Psyonix? DH: I’m Dave Hagewood, Director of Development at Psyonix. Nu: As you can probably tell from my website, I’m mostly an Xbox 360 gamer, who is still branching out to the other consoles. With the 360 having publically available tools like the XNA Studio and other familiar development tools, what draws you to develop on the Playstation 3? DH: Sony has done a great job making their platform available to smaller-sized, independent studios. In fact, they pretty much welcomed us with open arms whereas there are an enormous number of titles competing to go on XBLA right now. XNA Studio is fantastic, but we are Unreal Engine developers at our core. UE3 makes it just as easy to develop on either platform and I think a lot of small studios don’t realize how accessible Epic Games has made their technology for downloadable games. Nu: Supersonic Acrobatic Rocket-Powered Battle-Cars appears to be Psyonix’ first full game – is it? And how was the process of developing a full game different from working on certain game types and levels as you have done in the past? DH: It is our first title developed entirely in-house. We’ve been fortunate to have been involved with shipping games all the way to completion several times before so it actually went pretty smoothly as this is a smaller game than most we have worked on. We are also self-publishing the game however and that definitely presented a new challenge for us. Lots of paperwork! Nu: Have you considered porting the game to the Xbox Live Arcade, or even the Wii Shop? DH: The game is exclusive for PLAYSTATION(R) Network right now but XBLA is definitely a platform we are considering for the future. Nu: How did the concept come about / How was this game first pitched? DH: We started thinking about it shortly after we did Onslaught for Unreal Tournament 2004. I’d always wanted to do something we cars that can jump and it just went from there. We had the idea that by “bootstrapping” the development in between outsourcing projects we could develop the game for as long as we wanted, with no real deadlines or budget restrictions. Because of this the concept actually changed quite a bit. It started out as more of a track challenge game. From there it went to a vehicle combat multiplayer game, and finally the soccer-based we have today. We didn’t intend for the soccer game to be much more than mini-game at first but after playing for a while we quite literally became obsessed with it around the office. At that point we knew it was the game we had to do. Nu: Though “arena” concepts have to be similar, how many levels will be shipping with the game? DH: Three levels will ship with the game with more to come shortly after release over DLC. We really want to support a community around the game and do as much free DLC as possible. Nu: Free is always music to the ears of people out here! Here’s hoping! Are the cars like players in a sports game, with different classes or stats? Or are all vehicles created equal? There are subtle handling differences just because of their different shapes but for the most part they are equal. We see the game as a serious competition game and we don’t want to introduce balancing issues with cars that have differing stats. Nu: Let’s say I just downloaded the game, can you give me some advice as a first time player? Make sure you learn to powerslide right off the bat so you can do a quick turn. Also, don’t be afraid to jump to hit the ball! Nu: How many players can play the game online simultaneously? Will the game include local split screen? If so, can split screen players also go online? DH: 8 players online, 4 players split-screen, and yes, split-screen/online combos are supported. We wanted to support everything mutliplayer! We even support a persistent team system where you can register a team with your friends that actually gets ranked in the leaderboards with its own name. Nu: Very interesting! Few games support a good team system! Will the game support regional / global leader boards? DH: We totally support leaderboards, both individually and team-based. Nu: Do you have any plans to release downloadable content? DH: Yep, as I mentioned above we already have a new arena that will be ready very shortly after release. Nu: Is the game being released internationally? DH: US is coming first with Europe shortly afterward. Nu: Is there a target release date or a set price point, yet? DH: Not yet, but we should be announcing that soon. Right now all I can say is early Fall. Nu: You guys have a history of working with modders-turned-employees… do you have any plans to include a level editor and level-sharing (ala LittleBigPlanet) to see what your fans can create? DH: That is a very big endeavor for a downloadable title. It is something we would love to do in some way in the future however. Nu: And the irresistible question: the previews for Gears of War 2 have shown quite a few “vehicle” scenes. Were you guys heavily involved with the production of Gears 2? Nu: I would totally still buy that game! 🙂 I want to thank everyone for their time, and wish you the best of luck in with Battle-Cars and all future endeavors. Final question: would you be willing to share you Playstaion Network ID so we can find you online for a challenge? DH: Sure! I’ll be on as “CapitalistDog”. Nu: And that’s it for my interview with Dave Hagewood, Director of Development at Psyonix! I can’t thank these guys enough, it seems like they have gone above and beyond to take their time out for a little site like mine. I truly appreciate it. You may have noticed I forgot to ask about a demo – well there are murmurs about one floating around out there, and I have asked Dave a follow up just to get some kind of confirmation. I will update this article when I hear back from him. I doubt we will be able to get a date on that, as the final launch date for the game hasn’t been officially set, either – but we’ll all know soon enough. And you can bet WinBreak will be covering that as soon as it happens! Until then, thanks for reading another WinBreak Exclusive. 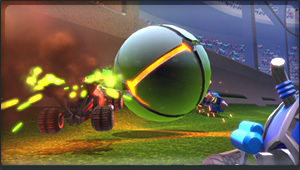 Posted in GamingTagged exclusive, Psyonix3 Comments on [update 1] WBX: Supersonic Acrobatic Rocket-Powered Battle-Cars Developer Interview! Not to speak out of line, but I think this is the kind of game that might hinge, for many people, on a demo. Here’s hoping they can push one through to Sony. 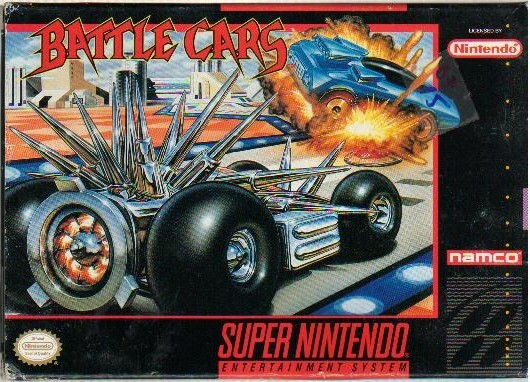 Until then, I’ll be playing my version of Battle Cars. 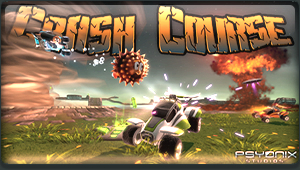 Posted in GamingTagged Battle-Cars, PSN, Psyonix1 Comment on Crash Course renamed: now a mouthfull. The gear heads (determine just how funny that is as you read on) over at Psyonix are working on their own game. Tired of barely getting recognized for their work in other multi-platinum games, the team that brought us “Burn’t Rubber” in Gears of War is now combining cars and sports… some how.